Did you know that Midpac offer printed banners? 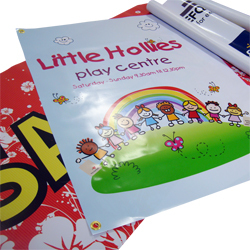 Available upto 30" wide and sold by the metre in length, our strong 440gsm PVC banners are suitable for internal and external use. Standard lead time from approved artwork is normally 4 to 5 working days, however this can extend through busy periods such as Christmas etc. Printed single to full color process all banners are hemmed each end for strength and fitted with metal eyelets for hanging. You are purchase your printed banners direct from our website or call our printed sales team on 02476 473647 option2. 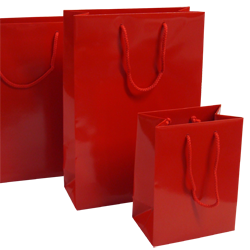 Midpac are introducing a new range of stunning red gloss paper carrier bags to there stock range. The red bags will be arriving mid January 2011 ready for Valentines Day. Available in 4 sizes range from our extra small bag 115mm to our large landscape bag 410mm. All sizes will be stocked in Coventry and available to purchase online in packs of 10's. We will also be able to offer the red gloss paper bags printed with your logo, quantities will start from 50 bags with a single colour design. Midpac supply 1000's of printed paper carrier bags for exhibitions and trade shows. Our most popular style and size of bags is our 240x100x320mm white gloss laminated paper carrier bags. 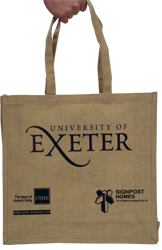 This bag is very popular as it is made from 170gsm Bristol board, and fitted with a reinforced card top and base. 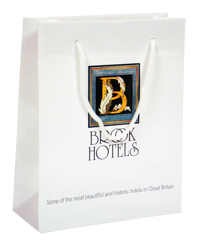 The paper bags are available printed for 1 colour to full colour process, quantities starting from 250 bags. With our print facilities here in the UK, Eastern Europe and Asia we can cater for all needs required. If you require a quotation or samples please do not hesitate to contact our print sales team. 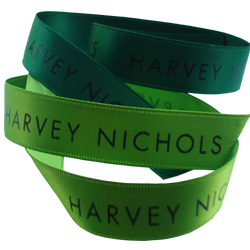 Luxury double faced satin ribbon in forest green and kiwi shades, foil printed with a solid black embossed logo. Harvey Nichols have purchased various printed ribbon from ourselves for promotions and Christmas events. 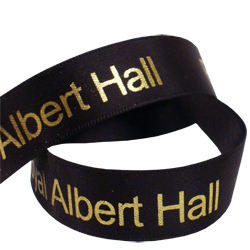 The beauty of printed ribbon service is the fact we can turn round orders from approval of artwork within 7 working days, and the minimum is only 1 roll 91 metres. 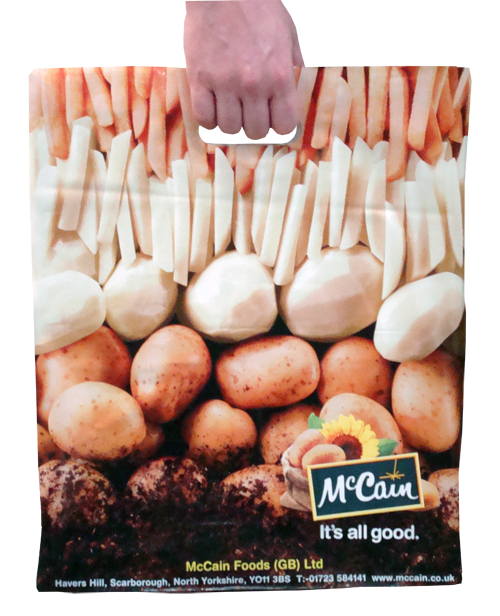 Midpac are been producing printed carrier bags for over 70 years. Whether you are looking for polythene carrier bags, paper carrier bags, jute bags or cotton bags, we are able to print them all. From single colour to full colour process designs. Standard lead time on polythene bags is 2 to 3 weeks, paper bags 6 to 8 weeks, laminated paper carrier bags 5 to 6 weeks. Express service available for smaller print runs within 7-10 working days. Larger print runs can be produced from one of our far eastern factories in China, India or Indonesia. printed paper carrier bags from 250 bags? Did you know that Midpac offer matt laminated paper carrier bags or gloss laminated paper carrier bags printed 4 colour process from as little as 250 bags. 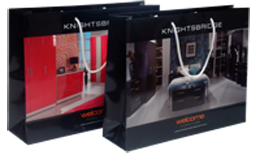 All bags are produced from strong 170gsm board, and fitted with a card reinforced base and matching coloured rope handles. With over 100 standard cutter sizes available and lead times from 2 weeks, our bags are ideal for exhibitions and product promotions. Midpac has it's 2010 christmas ribbon now on sale. Choose from double faced satin ribbon printed with Merry Christmas or chiffon ribbon with a christmas festive design. We have limited stock available, once sold this years ribbons will be taken off sale and not replaced. Please do not leave ordering your ribbon to late as there is already a huge interest being shown. 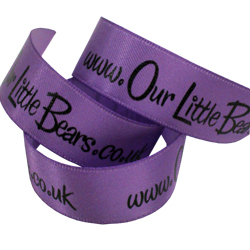 Aswell as our standard designs we are also able to offer personalised printed ribbon from as little as one roll. Midpac are producing more and more printed ribbon from there factory in Coventry. Our success to down the fact that we will print as little as one roll (91 metres). 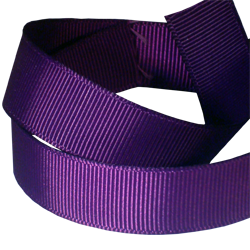 with over 100 shades of double faced satin ribbon available to choose from, printed in 18 standard colours, we can supply printed ribbon within 7 days from approved artwork. For multi coloured print runs or printed grosgrain ribbon we can offer competitive prices direct from our factory in Asia.